The use of video by ecommerce merchants can increase sales. We recently spoke with Ian Hackett, senior director of ecommerce and user experience at TRX Training, a retailer of exercise equipment, about the use of video for product sales. TRX Training has an extensive YouTube channel, and it also features videos on its own ecommerce site. Practical eCommerce: TRX Training uses video in innovative ways. Before we get into those video strategies, could you tell us a little about TRX? What do you sell? Where are you located? Ian Hackett: “We produce our own product. Our founder, Randy Hetrick, invented it while he was in the Navy SEALs. We produce best in class training equipment, workout programs and education courses around our two main product lines: TRX Suspension Trainer and TRX Rip Trainer. Suspension Trainer uses your body weight for resistance and Rip Trainer is about core stability and balance. So they are nice complementary products to one another. PEC: Can you tell us approximate gross sales? PEC: You have an impressive array of videos on YouTube. Do you also have videos on your site, Trxtraining.com? PEC: Let’s move to your YouTube channel. You have an extensive line-up of your product and exercise videos on YouTube. Why put them on YouTube? TRX Training’s YouTube channel includes nearly 400 videos. PEC: Are you concerned that people go to Google, search for products that your company offers, and get to your YouTube channel, instead of your ecommerce site? PEC: How do you know that the YouTube channel is producing sales? 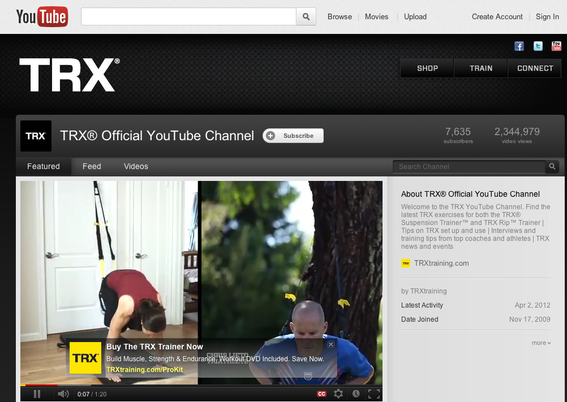 PEC: TRX Training places the new TrueView ads on its videos on YouTube. What are TrueView ads? PEC: Say you’ve got an exercise video on your YouTube channel that contains an ad at the bottom of it. What would that ad link to? PEC: So you could keep the video up on YouTube and change out different promotions that you are having at Trxtraining.com with those TrueView ads? PEC: You pay for those on a per click basis? PEC: Tell us about the videos themselves. How many videos do you have on your YouTube channel? Listen to the complete audio interview with Ian Hackett. PEC: How long are the videos, on average? PEC: How do you produce the videos? How much do they cost? PEC: What is your advice for smaller ecommerce merchants in terms of video usage?